Rotate this 3D model to see the four major regions of the brain: the cerebrum, diencephalon, cerebellum, and brainstem. The brain directs our body’s internal functions. It also integrates sensory impulses and information to form perceptions, thoughts, and memories. The brain gives us self-awareness and the ability to speak and move in the world. Its four major regions make this possible: The cerebrum, with its cerebral cortex, gives us conscious control of our actions. The diencephalon mediates sensations, manages emotions, and commands whole internal systems. The cerebellum adjusts body movements, speech coordination, and balance, while the brain stem relays signals from the spinal cord and directs basic internal functions and reflexes. 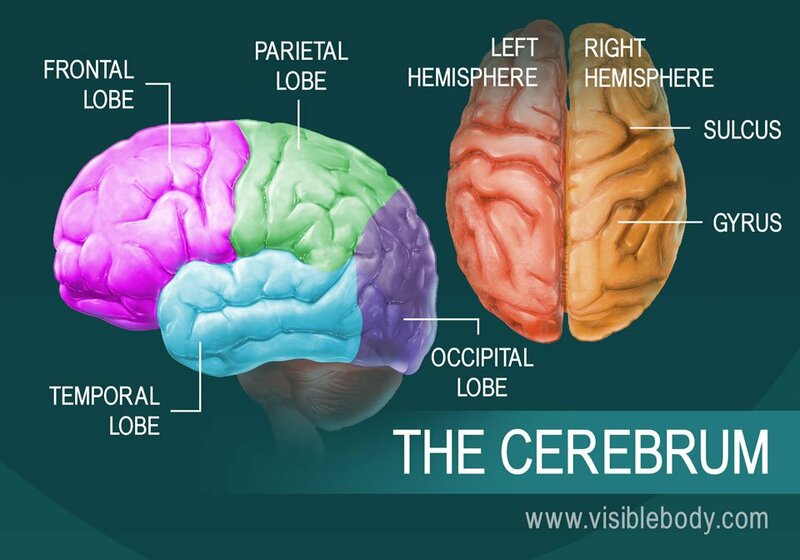 The cerebrum is the largest brain structure and part of the forebrain (or prosencephalon). Its prominent outer portion, the cerebral cortex, not only processes sensory and motor information but enables consciousness, our ability to consider ourselves and the outside world. It is what most people think of when they hear the term “grey matter.” The cortex tissue consists mainly of neuron cell bodies, and its folds and fissures (known as gyri and sulci) give the cerebrum its trademark rumpled surface. The cerebral cortex has a left and a right hemisphere. Each hemisphere can be divided into four lobes: the frontal lobe, temporal lobe, occipital lobe, and parietal lobe. The lobes are functional segments. They specialize in various areas of thought and memory, of planning and decision making, and of speech and sense perception. 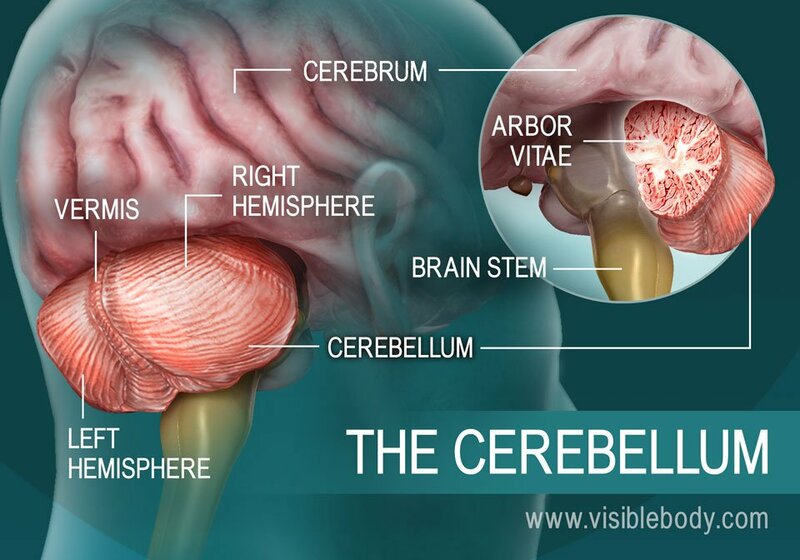 The cerebellum is the second largest part of the brain. It sits below the posterior (occipital) lobes of the cerebrum and behind the brain stem, as part of the hindbrain. Like the cerebrum, the cerebellum has left and right hemispheres. A middle region, the vermis, connects them. Within the interior tissue rises a central white stem, called the arbor vitae because it spreads branches and sub-branches through the hemispheres. The primary function of the cerebellum is to maintain posture and balance. When we jump to the side, reach forward, or turn suddenly, it subconsciously evaluates each movement. The cerebellum then sends signals to the cerebrum, indicating muscle movements that will adjust our position to keep us steady. Rotate this 3D model of the brain to see that the cerebellum is smaller than the cerebrum. The brain stem connects the spinal cord to the higher-thinking centers of the brain. It consists of three structures: the medulla oblongata, the pons, and the midbrain. The medulla oblongata is continuous with the spinal cord and connects to the pons above. Both the medulla and the pons are considered part of the hindbrain. 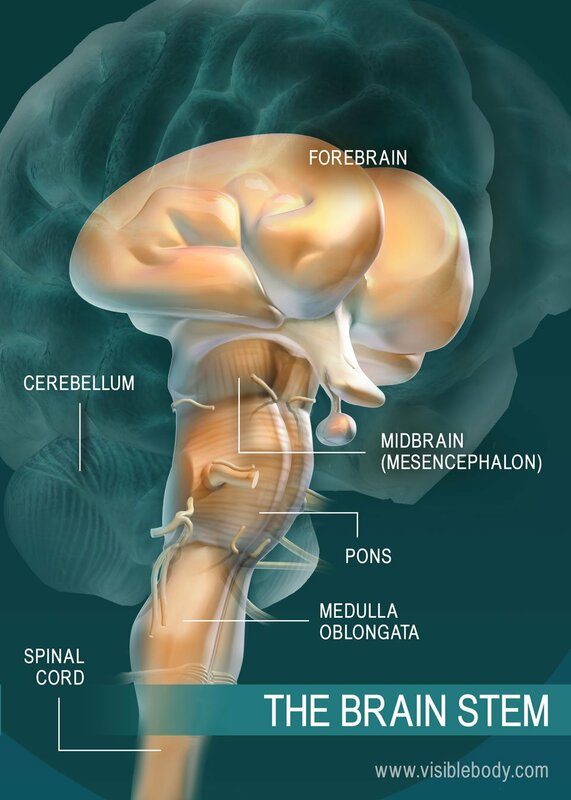 The midbrain, or mesencephalon, connects the pons to the diencephalon and forebrain. Besides relaying sensory and motor signals, the structures of the brain stem direct involuntary functions. The pons helps control breathing rhythms. The medulla handles respiration, digestion, and circulation, and reflexes such as swallowing, coughing, and sneezing. The midbrain contributes to motor control, vision, and hearing, as well as vision- and hearing-related reflexes. 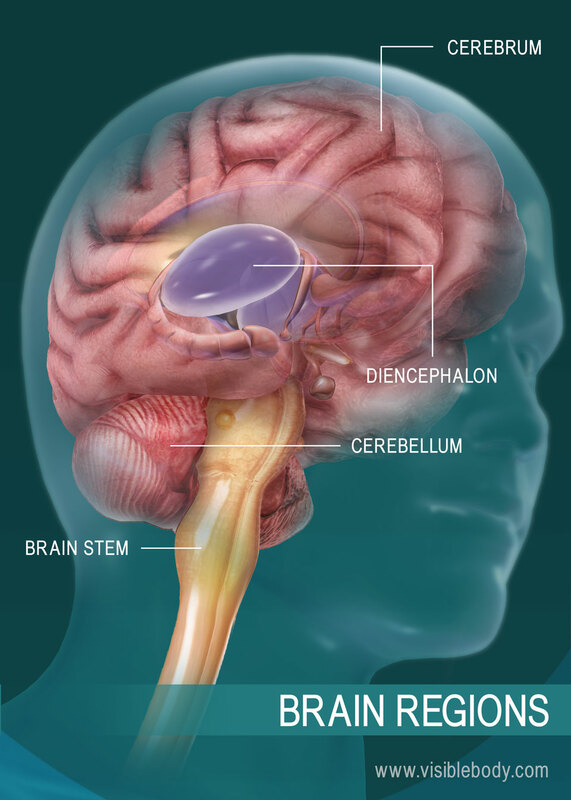 The diencephalon is a region of the forebrain, connected to both the midbrain (part of the brain stem) and the cerebrum. 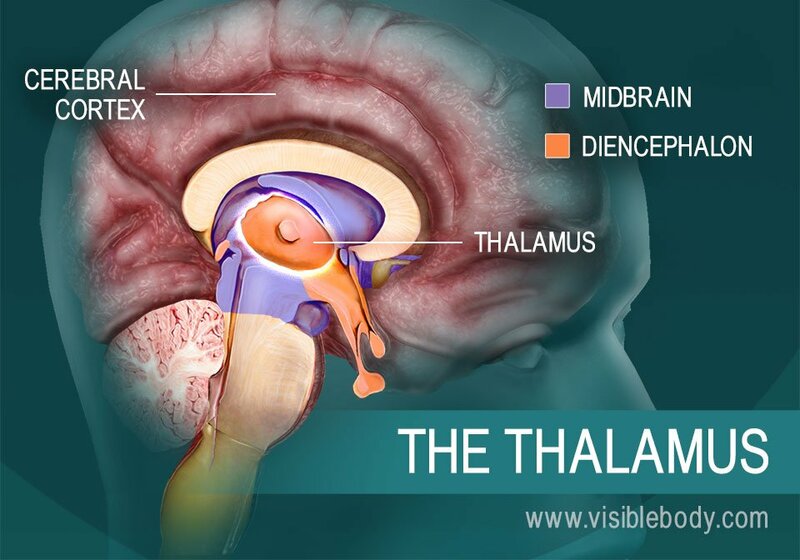 The thalamus forms most of the diencephalon. It consists of two symmetrical egg-shaped masses, with neurons that radiate out through the cerebral cortex. Sensory data floods into the thalamus from the brain stem, along with emotional, visceral, and other information from different areas of the brain. The thalamus relays these messages to the appropriate areas of the cerebral cortex. It determines which signals require conscious awareness, and which should be available for learning and memory. The hypothalamus is part of the diencephalon, a region of the forebrain that connects to the midbrain and the cerebrum. The hypothalamus helps to process sensory impulses of smell, taste, and vision. It manages emotions such as pain and pleasure, aggression and amusement. 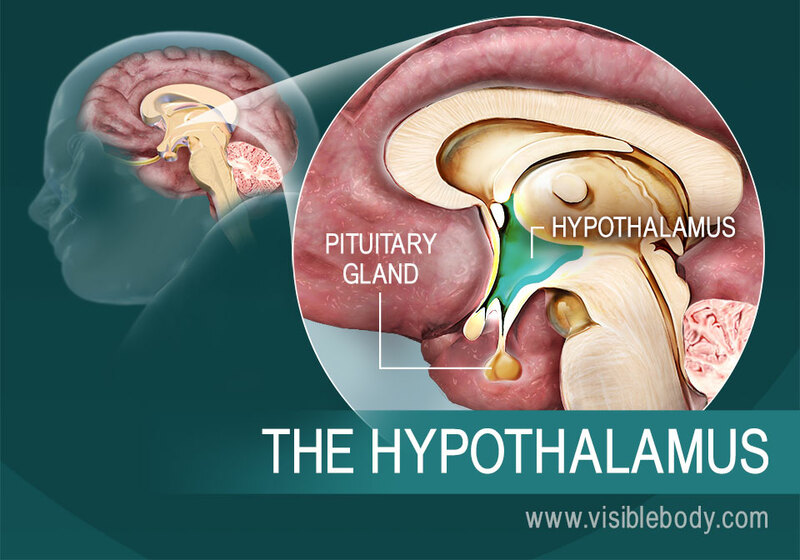 The hypothalamus is also our visceral control center, regulating the endocrine system and internal functions that sustain the body day to day. It translates nervous system signals into activating or inhibiting hormones that it sends to the pituitary gland. These hormones can activate or inhibit the release of pituitary hormones that target specific glands and tissues in the body. Meanwhile, the hypothalamus manages the autonomic nervous system, devoted to involuntary internal functions. It signals sleep cycles and other circadian rhythms, regulates food consumption, and monitors and adjusts body chemistry and temperature. An article in Science Daily on a research study about REM sleep and the pons, a part of the brain stem. An article on the anatomy of the brain in the University of Chicago School of Medicine Online Library.